There's a reason Boos Blocks are considered to be the best in the industry, and there's no doubt the reason is high quality wood that is handcrafted by wood experts. It's beautiful. It's durable. It's functional. And it's made from renewable and sustainable sources of North American Hard Rock Maple, American Cherry, American Black Walnut, or Appalachian Red Oak. In particular, their Hard Rock Maple is known as one of the most durable, long lasting, and best food preparation surfaces in the world. Butcher Blocks and Gourmet Furnishing - Islands, butcher blocks, tables, and carts are all options from Boos. What's functional and durable in the back-of-the-house is brilliant and beautiful, allowing it to be a show-stopper in the front-of-the-house. Countertops - Crafted from choice hardwoods, Boos countertops offer full length, continuous rails while blended countertops offer random lengths of finger-jointed interior rails using a harmonious blend of heartwood, sap, and natural mineral and grain variance. Classic end grain countertops offer the very best of natural elements, and all are available in a wide range of standard sizes. Foodservice Equipment - John Boos & Co. also makes an entire line of foodservice stainless steel products ranging from worktables to custom fabrication. 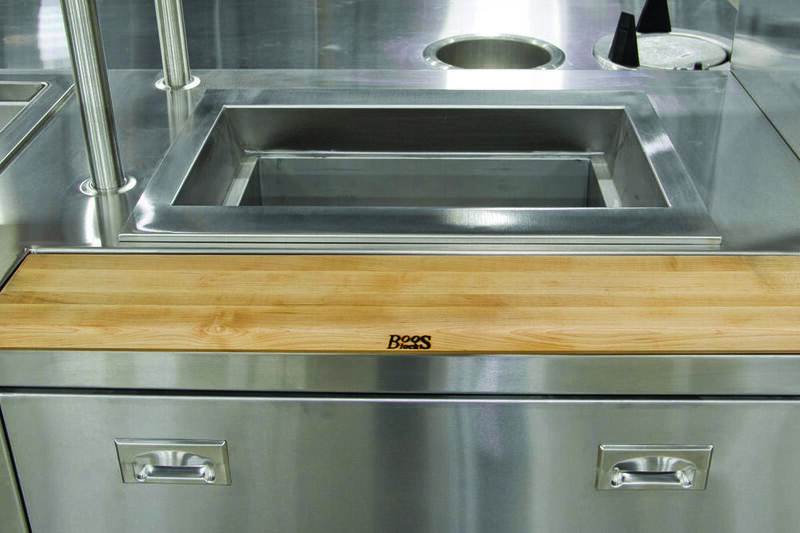 They combine stainless steel and wood to create a blend of commercial quality end grain and edge grain carts and worktables for professional foodservice and gourmet residential customers. John Boos & Co. is UL Listed (Underwriters Laboratories) and offers full custom stainless steel fabrication for our customers. Check out this introductory video to learn more about Boos Blocks. Learn more about Boos Blocks and how to purchase other game-changing foodservice equipment and supplies from PFEG. Check out our Intro to Foodservice Equipment Solutions.